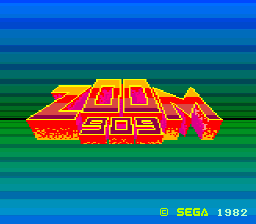 Zoom 909 (ズーム909) is an arcade game developed by Sega for VCO Object arcade hardware. It was released worldwide in 1982, however after obtaining a license for Buck Rogers, western versions of the game became known as Buck Rogers: Planet of Zoom. Both Zoom 909 and Buck Rogers: Planet of Zoom are largely the same game minus some minor graphical differences. Though most home ports of the game are based on Planet of Zoom, Zoom 909 was brought to the Japanese MSX in 1983 and SG-1000 in 1985. These versions take more liberties with the formula, introducing a top-down stage as level 3. Main article: Zoom 909/Magazine articles.